Christmas came and went without much notice around here. 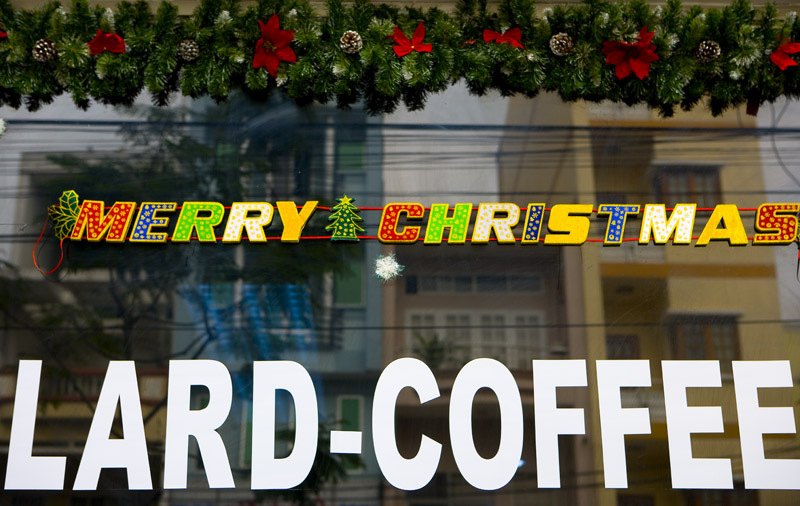 We're preoccupied with a number of other things at the moment, and honestly we've never cottoned to Christmas in Asia, with its somewhat soulless consumerist frenzy that rivals anything in the US (Philippines excepted - there, in spite of the heat, Christmas does feel like Christmas). Besides, we're half still in Vietnam, mentally at least. 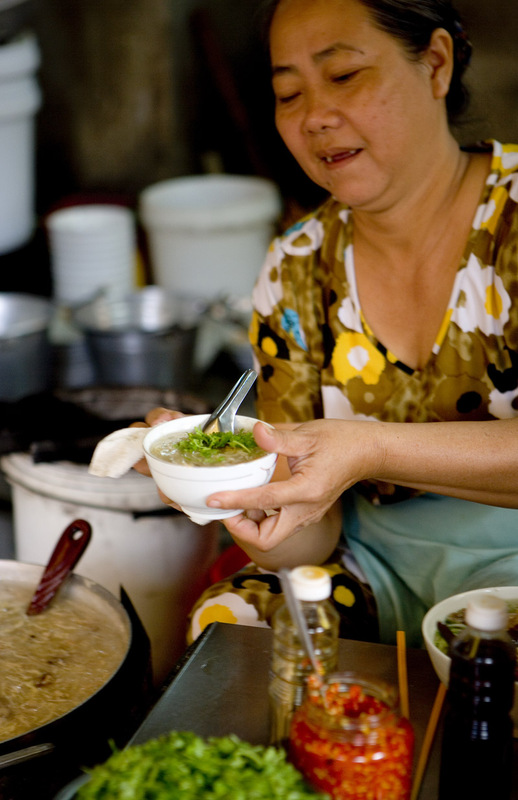 Today we're thinking of Saigon (though we're not done with Hoi An yet) and a simple but utterly delicious concoction dished up by a vendor at Tanh Din Market (just off Hai Ba Trung Street). We noticed this woman when we were there last August. Seated next to an enormous metal pot, she was surrounded every morning by a clutch of customers perched on tiny stools spooning up a pale soup from small bowls held close to their mouths. 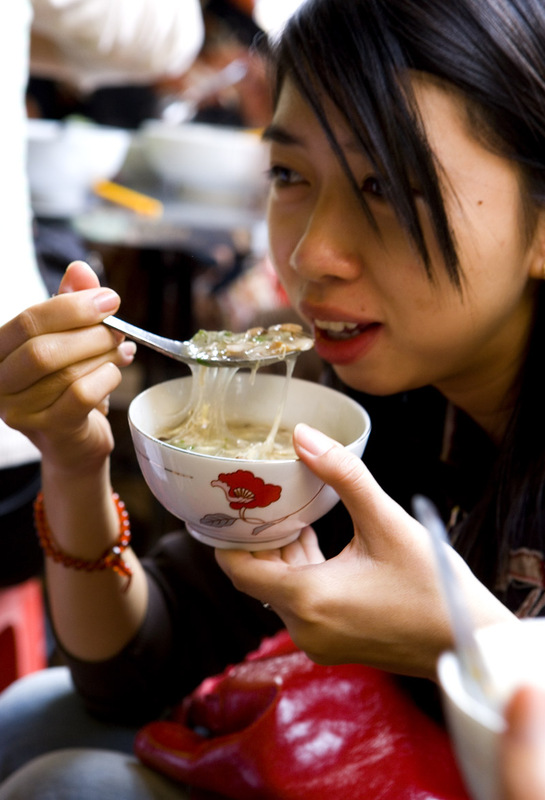 We assumed it was chao (rice porridge) - an excellent chao we figured, if her steady business was any indication - and vowed to investigate further when we had a chance. 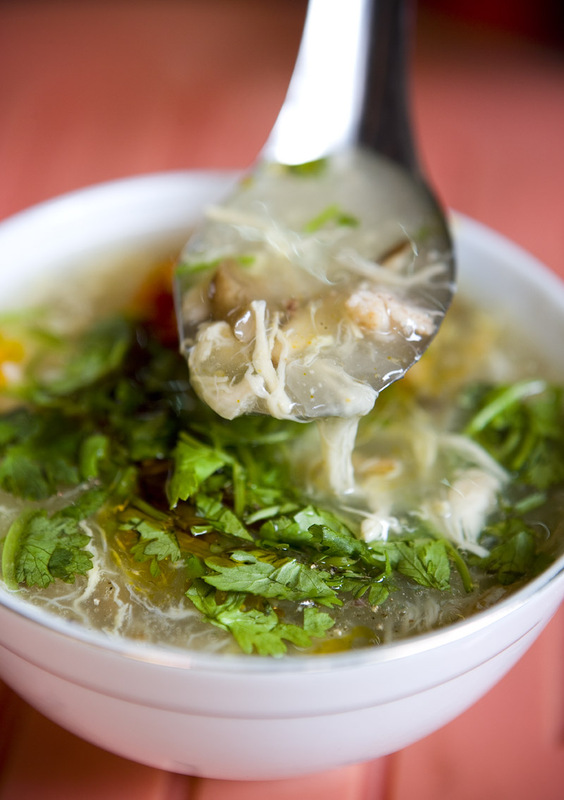 Said opportunity presented itself a few weeks ago, and we found that her specialty is not chao but sup cua, or crab soup. 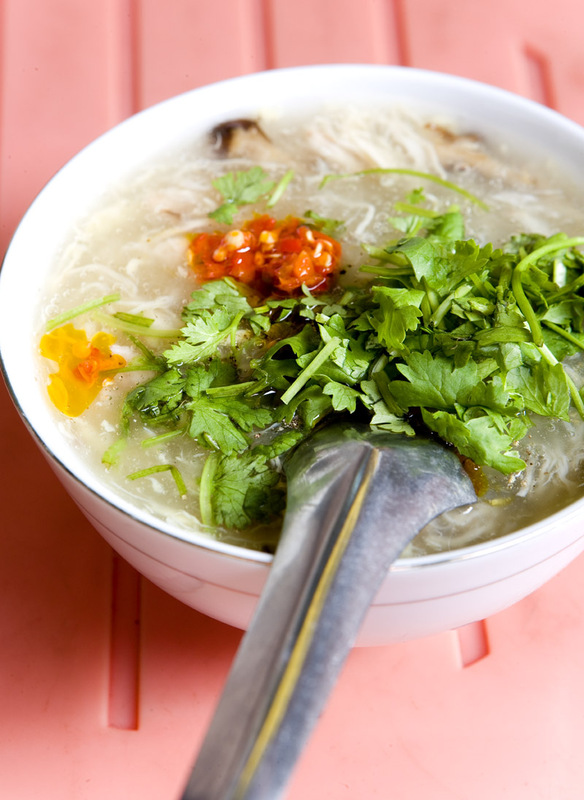 Sup cua is fairly viscous, along the lines of a banh canh, but if you can get past the texture you're in for a treat. What we assumed were egg threads crowding the broth turned out to be shreds (and a few chunks) of super-sweet crab meat and the thinnest slivers of dried Chinese mushrooms. This vendor's broth is so redolent of crustacean that it must be made from boiled with crab shells. She tops each bowl with a sprinkle of fresh coriander and a blob of chili sauce; diners are left to add soy, if they wish, white pepper, and yet more cilantro and chili. It's a small bowl but the soup is filling. Assertively crabby but generally mildly flavored, it makes for a comforting breakfast. Our neighbor and her mother, residents of the 'hood, told us they eat breakfast here everyday. We sure wish we could. Sup cua, Than Din Market (front 'food court' - this vendor sits across from the wooden hu tieu cart), early morning to mid-afternoon. We're moving house in a few weeks. This will be our 16th move and I believe I can say with a certain amount of authority it doesn't get any easier. Nonetheless, we are viewing this chore positively, as an opportunity to pare down, lighten up, downsize. That's what we tell ourselves anyway. In reality when I look at the amount of stuff we'll be giving and/or throwing away I can't help but feel we really haven't risen to the occasion. Cookbooks, for instance. I have a stack of just 15 giveaways -- out of hundreds. Logic tells me that cookbooks should be like clothes - if they haven't seen the light of day in more than a year they're out the door. Given the amount of cooking I do (much less than when I wasn't writing about food, ironically enough) there's no way in Hades I could use all of my books in a year. Yet for whatever reason I can't bear to part with most of them. Baking in America and Maida Heatter's Book of Great Desserts I used to bake a lot, but now my cake pans lie unused, my cookie sheets bereft. I use the oven more for warming plates than I do for making anything sweet. I bought the first book a couple years ago, and I've only cracked it a couple times, never used it once. My mom gave me Heatter's book when I was at uni. It's well-used, and I topped off some memorable meals with its creations. But I'm not sentimental. I loved it then, but I couldn't care less about it now. Out it goes. If I do get the urge to bake I've got this book, which is probably one of the most overlooked baking tomes out there, perhaps because its author died much too young some years ago. I've made countless desserts from it - cakes, cookies, pies, tarts, compotes, puddings, you name it - and they've all been of 'that's the best I've ever tasted' quality. It's all the baking book I need. But I've also got this one just in case I want to whip up something sweetly exotic. The Minimalist Cooks at Home Who doesn't love Mark Bittman's columns in the New York Times Wednesday Dining Section? I always read them but I rarely cook from them. Same with this book. Buh-bye. The Thousand Recipe Chinese Cookbook This might be the first cookbook I ever owned. It's mammoth, a sort of Chinese cooking newbie's bible. I never took to it, preferring instead Kenneth Lo's Encyclopedia of Chinese Cooking (which I rarely cook from now but do use for reference). We eat a fair amount of Chinese around here and these days I'm mostly using two Sichuan cookbooks. The latter is relatively unknown, but its recipes are quite authentic (if confusingly written). It was given to me by my future mother-in-law shortly after Dave and I returned to the US from Chengdu, where we taught English in the 80s - a very good omen for future in-law relations, I think. Kitchen Conversations I like the idea of this book: recipes accompanied by discussions of how different flavors and ingredients work together, and input from a sommelier (the author's son) on pairing wine with the dishes. When we moved to the San Fran Bay Area in 1990 I bought the author's first book and cooked from it extensively - like, cover to cover - and I still think it's fantastic. But I just couldn't get that excited about this one. Simply Tuscan, Food of Southern Italy, Italian Farmhouse Cookbook My bookshelves hold almost as many Italian as Asian cookbooks, so I probably should have forced myself to part with more than three. These have sat untouched for too many years. My go-to for Italian (besides, of course, Marcella Hazan) is anything by Lynne Rosetto Kaspar, whom many readers (in the US, at least) know from NPR's Splendid Table. I was cooking from her books before she became a radio star; The Italian Country Table is probably the most oil and sauce-splattered book in my entire collection, and The Splendid Table (about Emilia-Romagna, not the radio show of the same name) combines history and recipes to great effect. Cooking at Home on Rue Tatin and The Paris Cookbook Though I loved Loomis' memoir of living and cooking in a French town my affection for a few other French or French-ish cookbooks left little room in my kitchen for her cookbook. It looks like a good one, but I only cook so much French; I know I'll never get to it. As for The Paris Cookbook well, what can I say? I've never been to the City of Lights (gasp! yes, it's true) and many of the recipes are just too rarified for either my palate or my humble kitchen. Paula Wolfert's World of Foods Wolfert is a true culinary anthropologist. I am totally in awe of what she does, have all of her other books, and at least read, if not cook from, them pretty often. But this collection of unrelated recipes I really don't need, so I'm chucking it. Chez Panisse Pasta, Pizza, & Calzone I don't make pizza, calzone, or pasta. If I decide to, I've got a gzillion other books I can consult (see Italian entry above). And a reprieve: Glorious Foods of Greece sat at the top of my pile last night, but I rescued it this morning. I've cooked from it maybe once, and recently bought this book which is now my Greek food bible. But Glorious Foods includes recipes for so many interesting and little-known regional specialties that I want to hang onto it just in case we ever go to Greece - it would serve as a great guide book. What cookbook(s) could you do without? 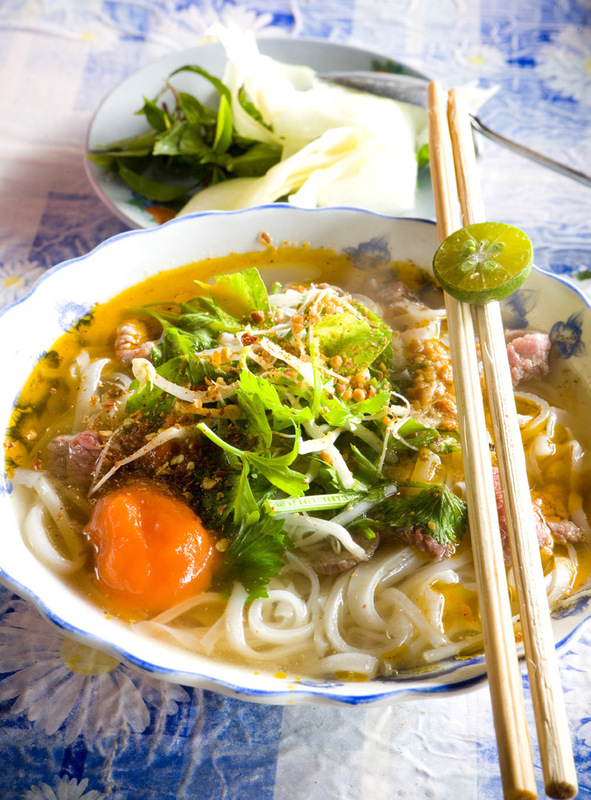 They do pho a little differently in Hoi An. We eyed this popular stall on our first morning at the market, then returned the next day to find the vendor absent, his space empty. 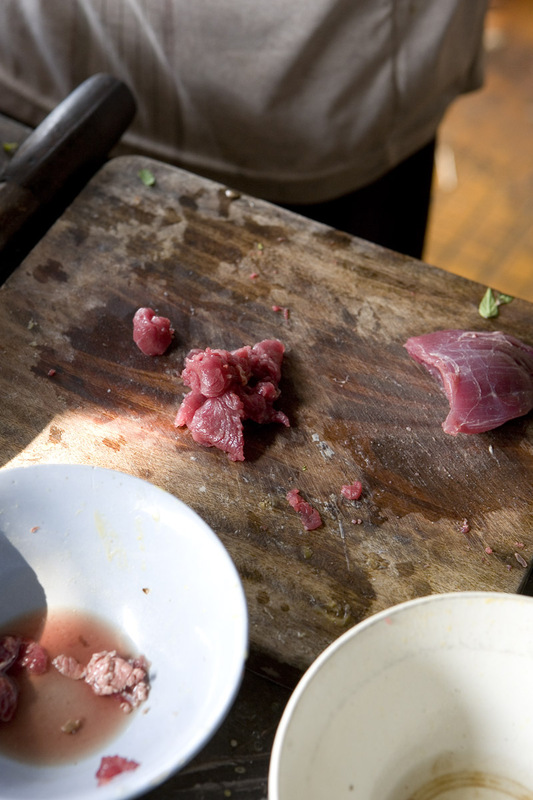 It was the first or the fifteenth of the lunar month and most of the market's prepared food sellers - save our favorite cao lau purveyor - had gone veggie or stayed home. When he didn't appear the next morning, or the next, we feared we'd missed our chance. 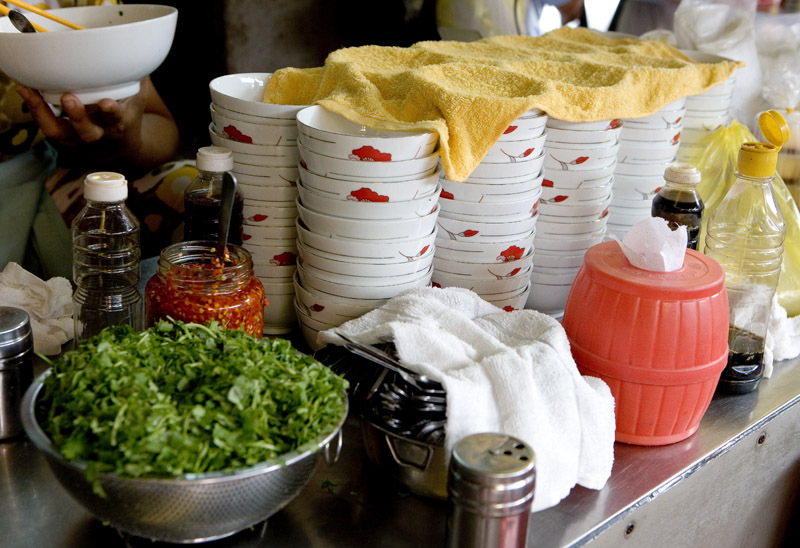 But on our last morning there he was, back in business, sending out tray after tray packed with steaming bowls of pho. He does a simple beef pho, with what we can only assume is a central coastal twist: after noodles, meat, and broth are in the bowl he adds a hefty spoonful of viscous fermented bean sauce (the pot in the center, below). 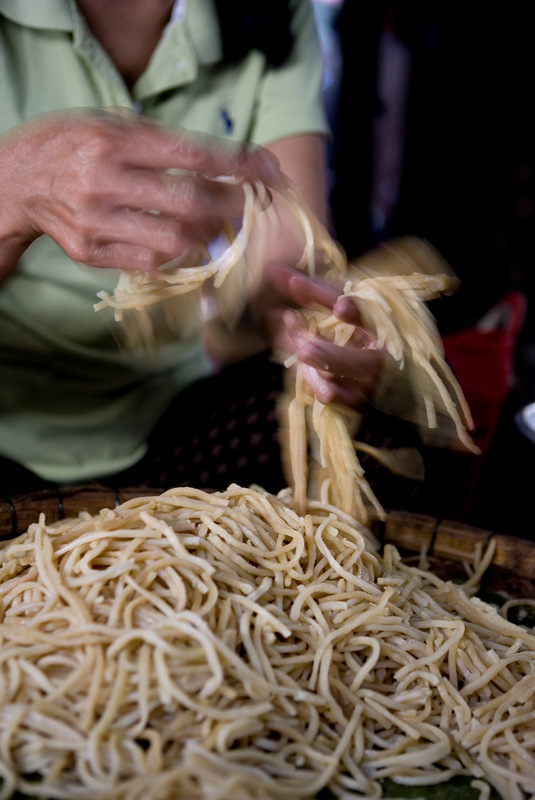 And with his noodles he serves a plate containing a jumble of fresh herbs, wide slices of pickled green papaya, and a mound of roasted dried chili flakes. What we like here are the the herbs, which are varied (Thai basil, rice paddy herb, teensy-weensy watercress, mint leaves and a parsley-like green) and plentiful, the richness-sans-sweetness that the bean sauce adds to the soup (super-sweet hoisin is more common in Saigon and around), the full-on heat of the dried chili flakes (reminiscent of Thai guayteow nam, for us), and the sour punch of the green papaya which, eaten together with the chewy noodles, makes for a crunchy/soft, steaming-hot/cool texture-temperature contrast tour de force. We're generally not pho-natics, but this is a great version. When my cold started to rear its ugly head I wished for something I was drinking quite a lot of exactly a year ago, while battling an even nastier cold while on assignment in Pampanga, Philippines. When a string of early mornings (as in 3am, for dawn mass) and non-stop days lay me low the kitchen angels at our host's home boiled up batch after batch of tea made with an herb growing wild outside the house. They called it 'oregano' (pictured below, and above - same name, two different leaves - two varieties, perhaps?). It eased my sore throat, cough, and general feeling of unwellness. This 'oregano' is actually Indian borage (Plectranthus barbatus), a fuzzy, fleshy-leafed herb thought to be native to India that's also found in Australia, where it's known as five-in-one (thanks to once-prolific EatingAsia commenter RST for this link and others related to the herb). In India the tuberous roots are also used as a spice or prepared as a pickle. And Indian borage is found in Vietnam, where it's known as hung chanh, tan la day, and thom long. 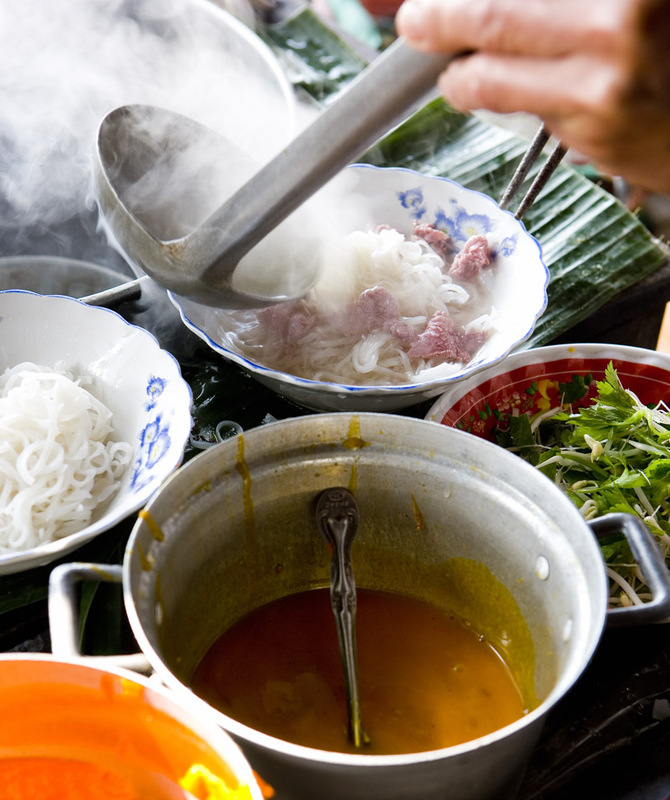 We first noticed it at a Hue/Hoi An market in Saigon; the vendor told us that it's not for eating, but for boiling into tea when you have a sore throat or cough. According to the link above it also grows wild in Malaysia, where it's known as daun bangun-bangun. We've not seen it in the market here, yet. 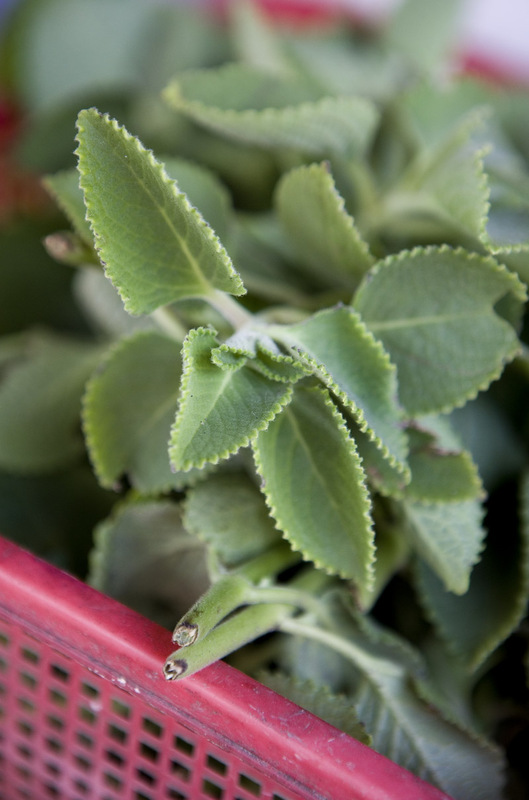 The herb smells a bit like Italian or Greek oregano but, to my nose, even more like sage or thyme. In Pampanga I asked if the herb was used for cooking; the response was 'no'. Yet something called 'oregano' is perhaps part of a dried herb mix called sangkot-sangkot that's added to a Philippine stewed meat dish called apritada. 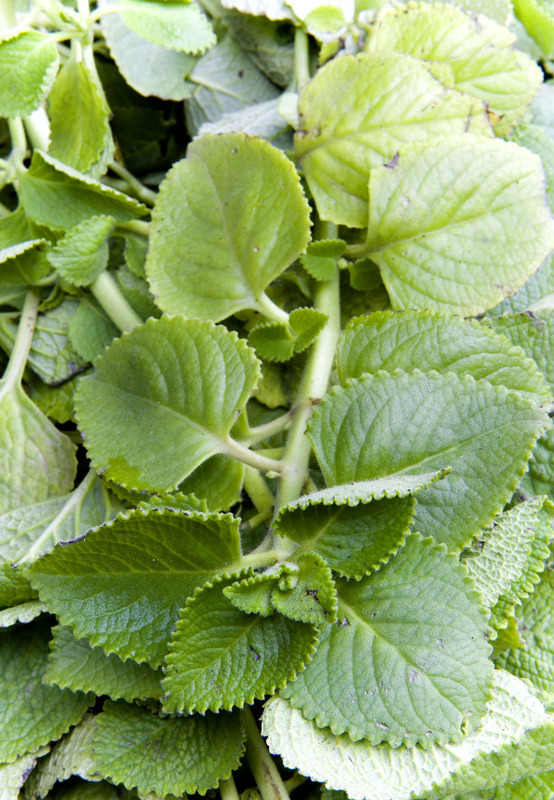 Intriguingly, the herb is also used in cooking in Cuba and the Caribbean, where it goes by the name of 'Cuban oregano' or 'French oregano'. 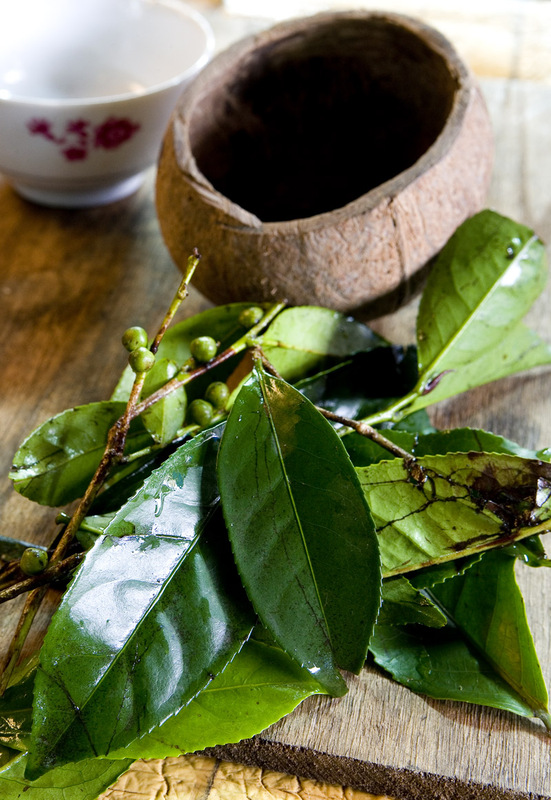 In this 2005 Miami Herald article chef and cookbook author Maricel Presilla writes that the plant made its way to Latin America during colonial times. Which begs the question - from where and via whom? From the Philippines with the Spanish? Or from southern India or Malaysia/Indonesia with the Portuguese? Or...? And how did the herb find its way to Vietnam? 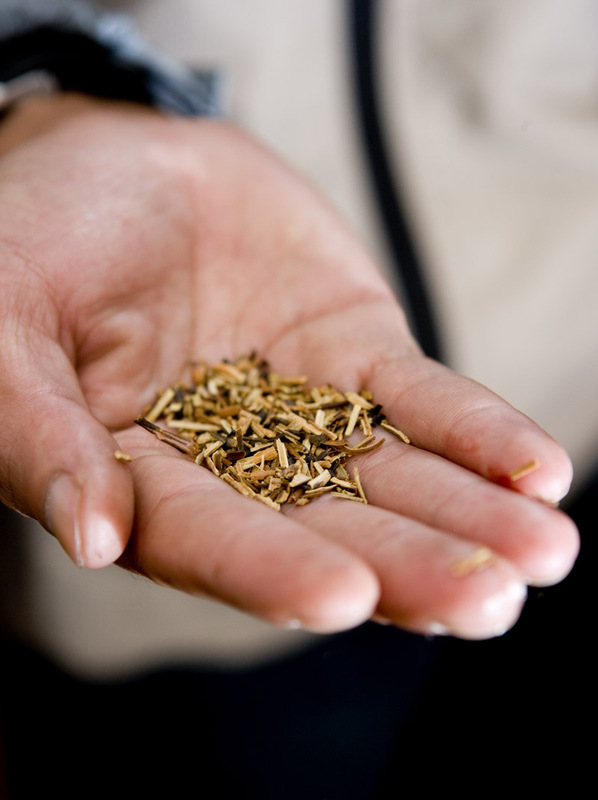 Filipinos, Australians, Indians, Malaysians, Vietnamese - anyone familiar with this herb - do you cook with it? And if so, how do you use it? But back to Hoi An. 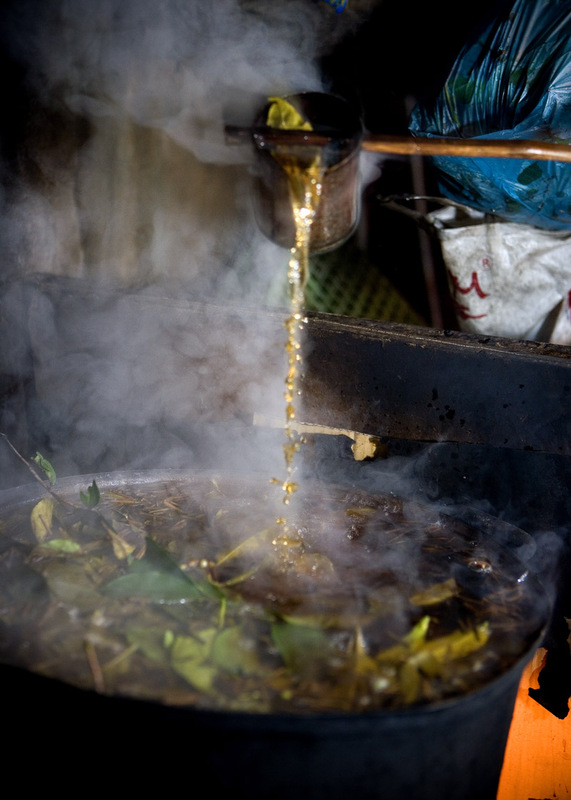 I searched for Indian borage tea in vain but I did find, bubbling away over a wood fire in a corner near the seafood section, a vat of che tuoi, or 'fresh tea'. 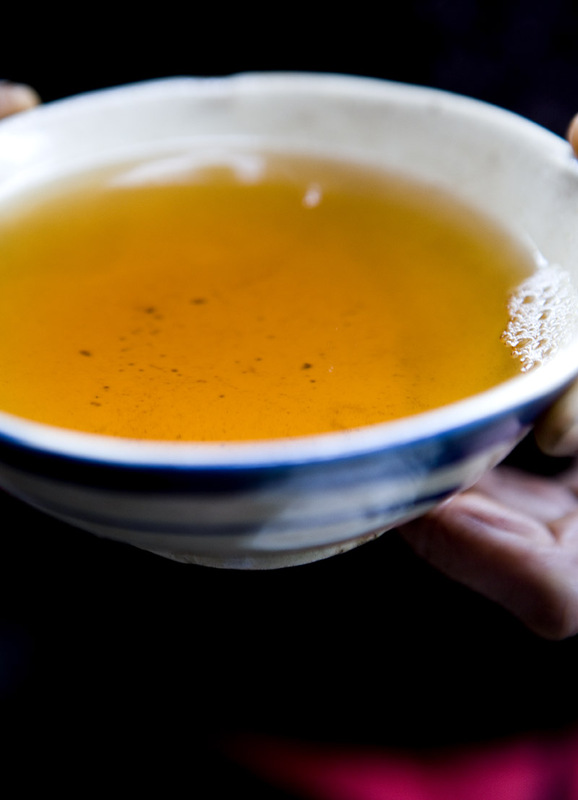 The leaves used for this tea are indeed unfermented and, from the looks of it, pretty old. Branches, berries, leaves - everything goes into the pot and the vendor, who's been pouring cups of che tuoi in the market for over thirty years, gives it all a good boil for a couple hours. This isn't meant as specifically a cold remedy but its slightly bitter, grassy flavor and warmth was most welcome on our misty Hoi An mornings. My cold, by the way, is pretty much vanquished, and in just over ten days. That's a record for me; these things usually seem to hang on for weeks. I don't know whether to attribute my quick recovery to che tuoi, thoughts of oregano tea, the handfuls of vitamin C tablets I began swallowing at regular intervals as soon as my symptoms appeared .... or candied turmeric. 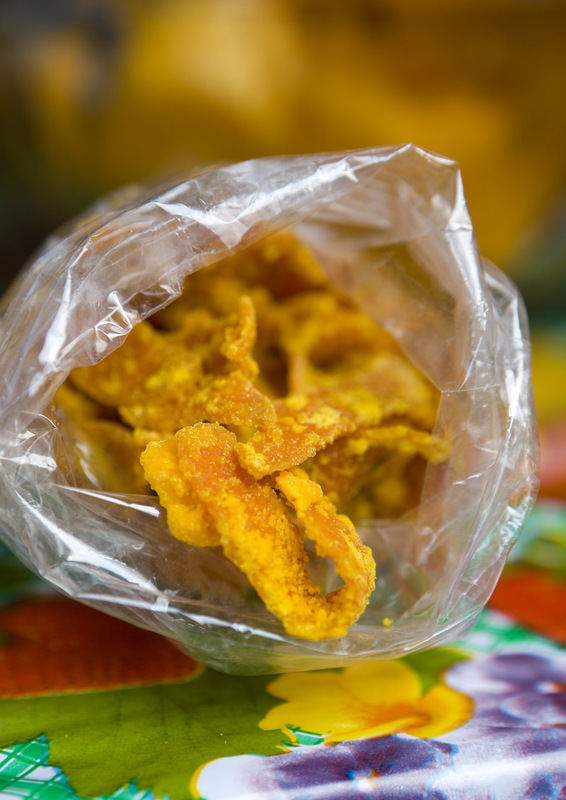 Candied turmeric is sold alongside candied ginger all over Hoi An's market. Before I even got sick a vendor told me it's good for a cough and sore throat. I bolted at least a half a bag at the first sign of a sore throat and then continued to snack on the astringent treat for a few more days. What's your (non-Western pharmaceutical) cure for the common cold? Dave and I spent last Saturday night in a Saigon bar, surrounded by Filipinos who were one moment exchanging misty-eyed hugs as a Filipino band (an exceptionally kick-a** Filipino, band by the way - there is a reason that Filipinos are known as 'the musicians of Asia') performed a sentimental ballad in Tagalog, the next lustily singing along to American hits from the 70s and 80s that even we don't know the words for. It was one of those great, accidental sort of evenings, an evening so fun even the killer hangover that followed me all the way back to KL the next day doesn't mar the memory. Dave ended up sharing a few beers with a guy from Butuan City (Mindanao). How serendipitous is that - us meeting, in a Vietnam bar, a Filipino native to one of the only three Philippine locales we've spent significant time in (the others being Manila and Pampanga)? It's a small world, indeed. He and his wife were eagerly anticipating a trip home for the holidays. It would be a family reunion and so talk ultimately turned to that pentultimate Philippine special occasion food: lechon. 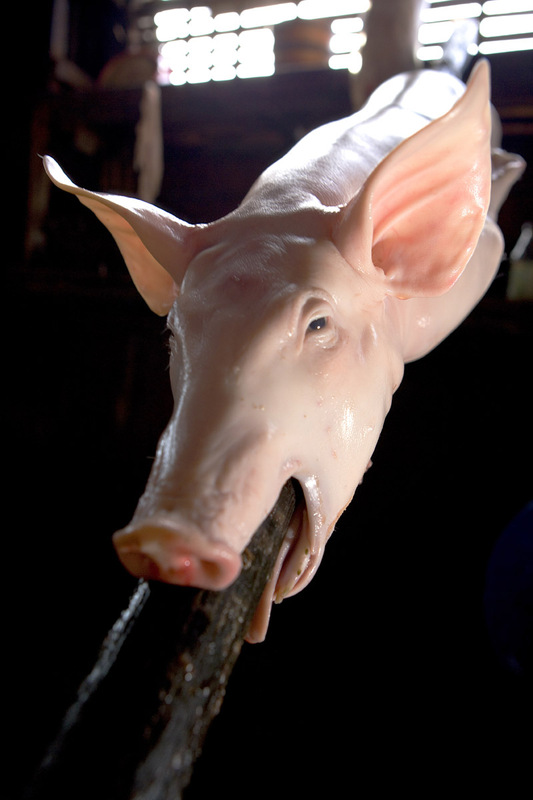 Any Filipino will tell you that all lechon is not created equal. Before journeying to Butuan City last February with our friend Marc (who also hosted us in Pampanga) we heard all about Mindanao-style lechon, uttering words like 'incredible' and 'the best' as we cooled our heels at the Manila airport waiting to board our plane. 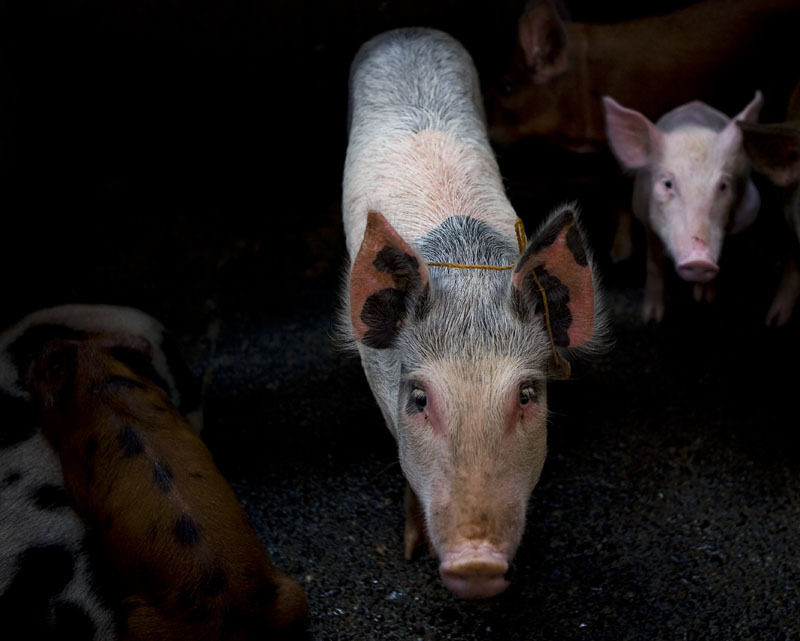 When we arrived to Marc's maternal uncle's house lunch was waiting, in the form of the famed local lechon: breathtakingly bronzed, the skin - flabby instead of Luzon- or Cebu-style crispy - cut away from the pig like a leather coat. Butuanons don't prize the skin and we ignored it, concentrating instead on the tender meat fragrant with a blend of herbs roasted inside the pig. We ate with our hands, greedily pulling off ribs and dunking them in dishes of vinegar made from nipa palm sap and spiced up with garlic and chilies. It was a tremendous lechon. Marc hadn't exaggerated. 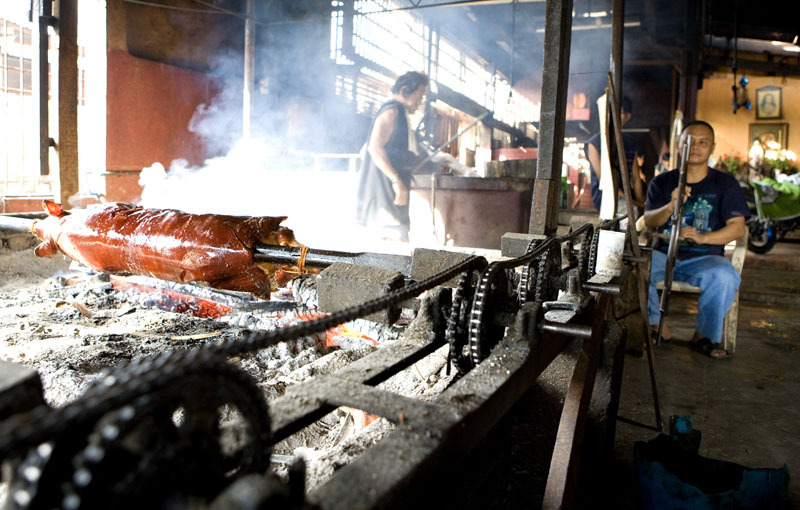 The next day we headed to Ippie Bantilan's lechon shop to find out what makes the local roast pig so special. 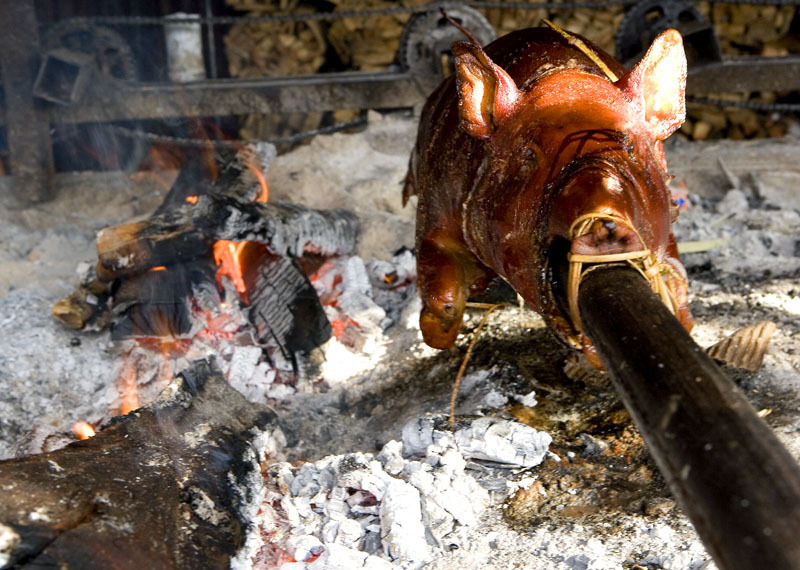 The family-run shop has been around for over forty years, and the lechon is prepared live to roasted in-house. The day's orders are kept in a pen in the back; while Dave snapped photos I tried to ignore their existence. 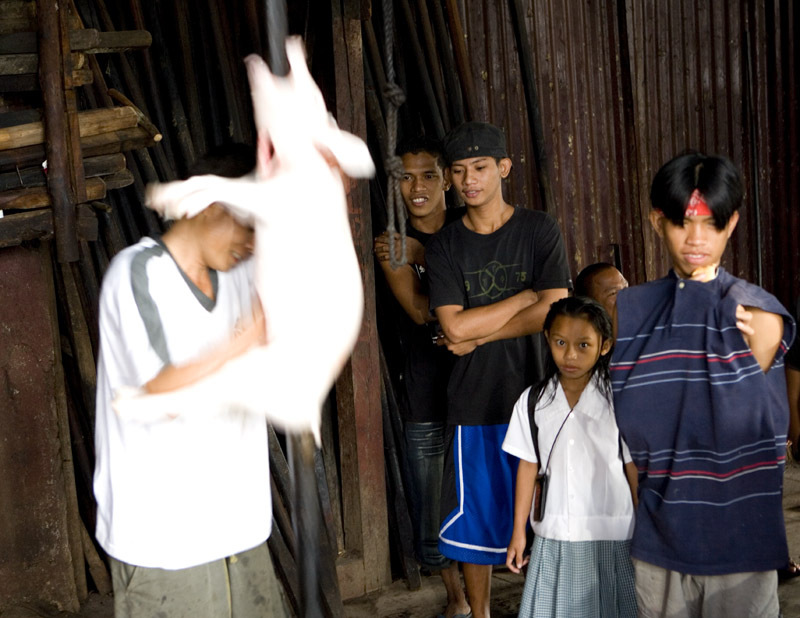 We arrived just after a couple of slaughters to find family members disembowling and cleaning a carcass. The first had been rejected because of its jaundiced liver (note below, the jaundiced liver on the left is pale while the healthy liver next to it is bright red). This is a rare occurrence, Ippie told us. and then skewered on a wooden spit. These days most lechoneros use metal spits. What makes a lechon a Mindanao lechon (beyond the fact that, unlike Luzon-style lechon, it's not served with a dipping sauce made with grilled pig's liver) is what goes inside - always green onions; garlic; red, orange, and yellow capsicum; serrano chilies; bundles of lemongrass and, at Bantilan's, also star anise and white peppercorns. before placing it over the indirect heat generated by two rows of burning mangrove wood. After a while one row is eliminated to reduce the heat. 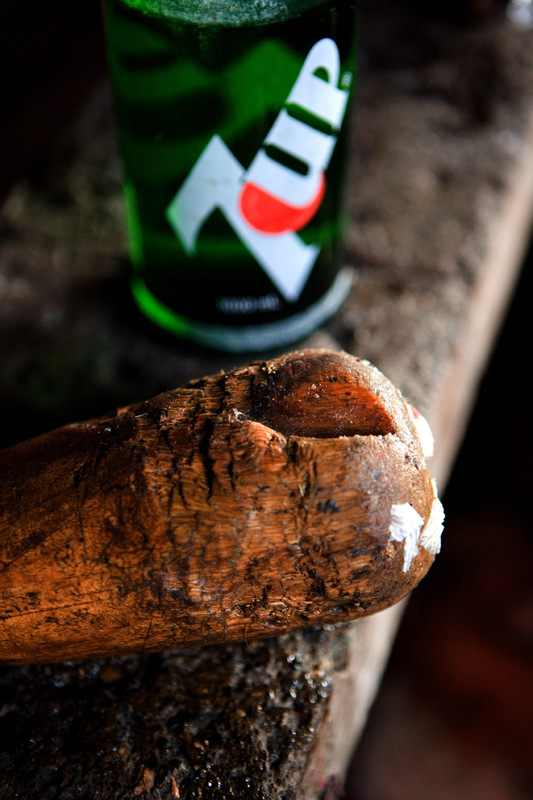 The spit is turned constantly by hand, with the help of a bicycle chain. and is placed on a board, swaddled in paper, and bundled off to the delivery vehicle. 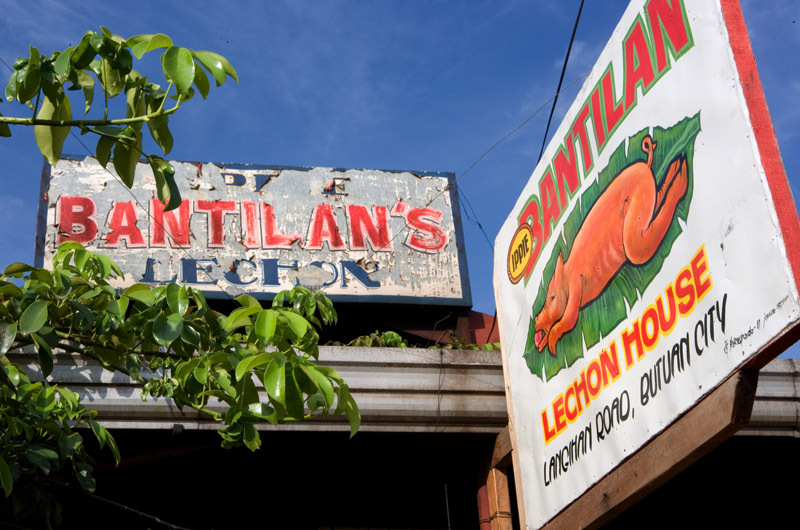 More than a few Bantilan lechon journey well beyond the immediate vicinity. 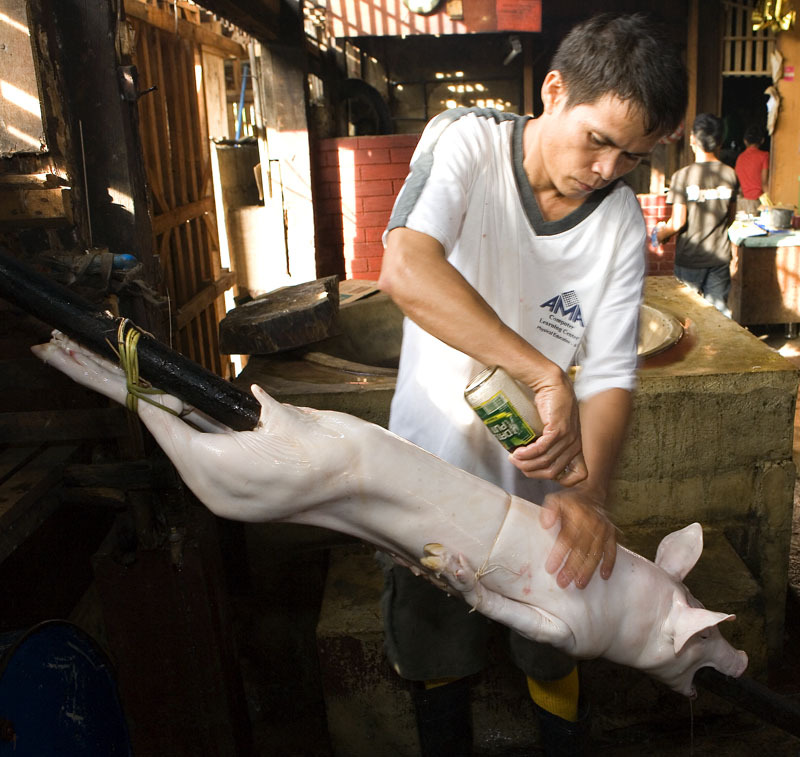 Filipinos don't think twice about packing an especially delicious pig back to family and friends. 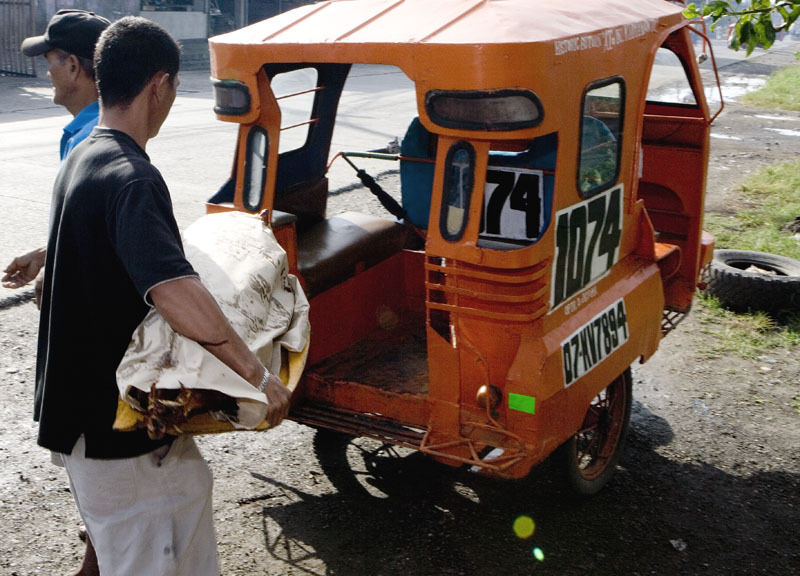 At the request of his Butuan City-born mother Marc bundled a couple back to Manila, encased in cardboard and checked as luggage. And we were treated to another for lunch, right before we left. 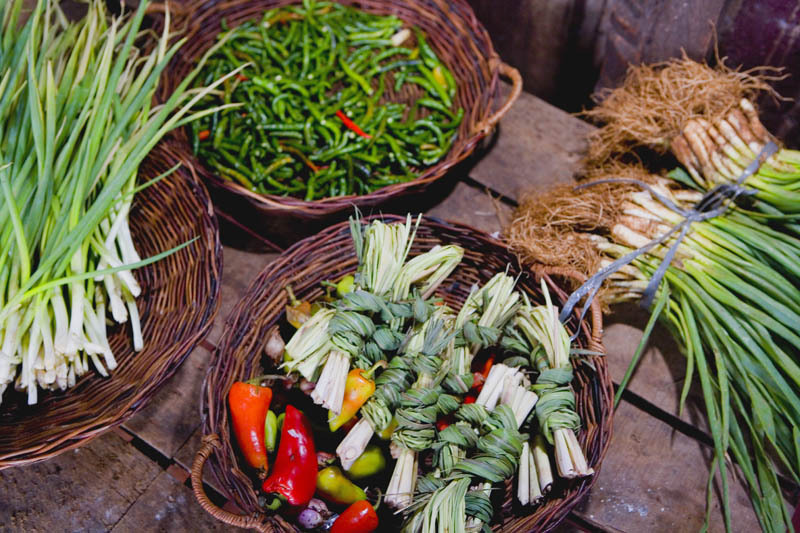 We went to Hoi An in search of great cao lau. We ate the dish all over town, but the version served at this stall (above) in the market is hands down the best (a version served at a shop not far away runs a close second; unfortunately for anyone squeamish about eating in the market or at a local-style eatery, every version we sampled in a proper restaurant or cafe disappointed). A proper cao lau - a noodle dish that allegedly originates in Japan - is a porky tour de force, featuring slices of stewed shoulder or leg, a rich dark broth imbued with porcine goodness, and crunchy squares of lard-ified dough (the crispies that top inferior versions are fried in regular cooking oil). 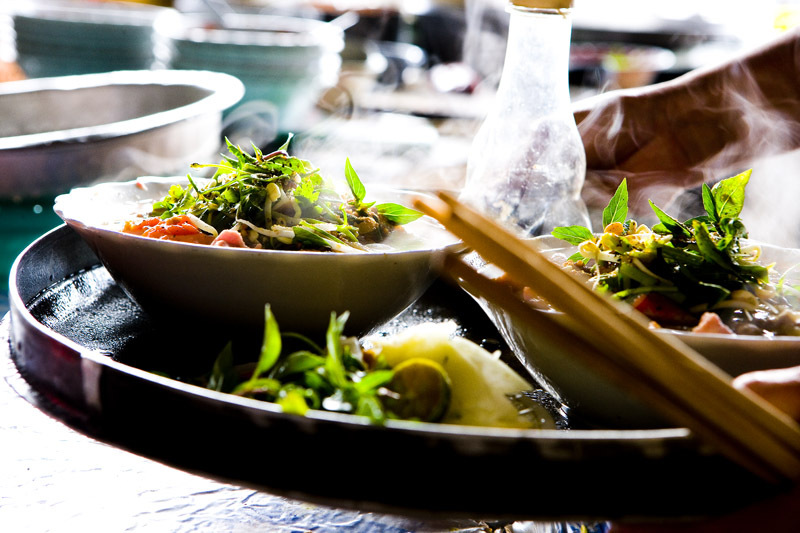 Last but not least the dish incorporates bean sprouts (blanched with the noodles, which have already been steamed before they're sold) and a characteristically Vietnamese mix of fresh greens and herbs, the components of which vary vendor to vendor. Curly leaf lettuce is a mainstay; Thai basil, rice paddy herb, sprouts of one sort or another, wild pepper leaf, mint, and fish mint might also make an appearance. So what makes this vendor's version Number One? 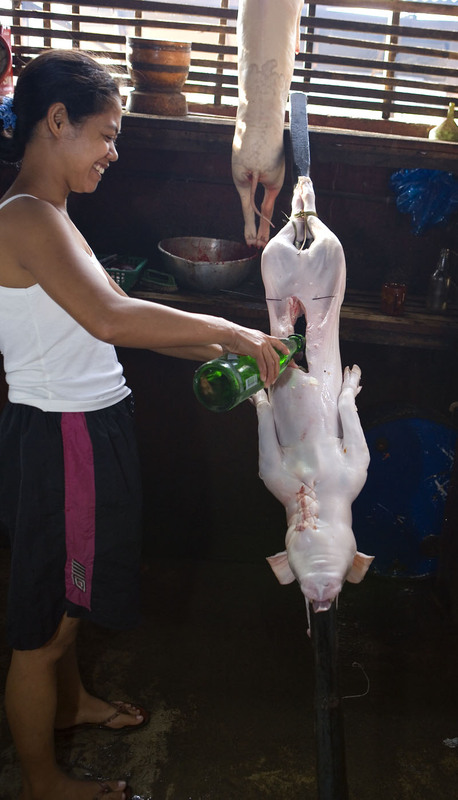 First, her pork is tender and shot through with the flavor of soy and whatever else she stews it in; many others top their cao lau with roasted or boiled pork that has little flavor on its own. Second, her 'broth' is rich and intense enough to call a 'gravy' (have a gander at the dark goo in that pot above). Cao lau is served just enough broth to cover the bottom of the bowl, so it really needs to taste of something besides Maggi sauce or msg-generated umami to make the dish shine. Third, she adds a nice variety of greens. Elsewhere we were served versions that included only lettuce and a token leaf of Thai basil or two - pretty shoddy, in our book. 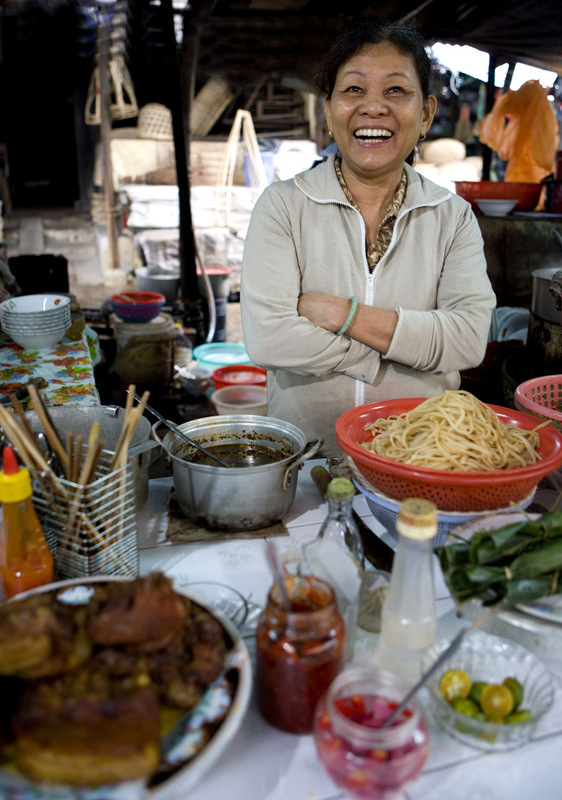 Also, this lady's cao lau boasts appropriately al dente noodles and crisp-tender sprouts. Finally, she offers alongside an exquisite chili sauce. Ruby red, a little sticky and slightly sweet but quite spicy as well, it might more appropriately be called a chili 'jam', it's a concoction I'd love to spread on garlic toast or dribble onto scrambled eggs. Definately a cao lau to remember. By the end of our last morning grazing the market we had absolutely no room for a final bowl. Poor planning on our part, and we're still regretting it. Last week in Hoi An we had time to do something we haven't in ages: hang out in a market. 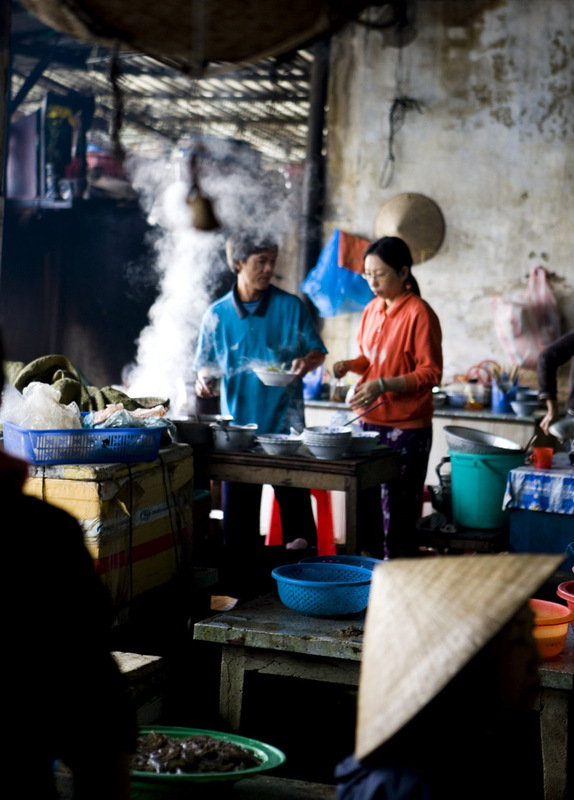 Hanging in the market is a particularly useful exercise in heavily-touristed Hoi An, where finding good Vietnamese food is a challenge. In the market it's a different story. There's so much fantastic stuff there that by the end of our fourth day our list of favorites had grown too long to manage in one morning. It's a damned sorry situation in which to find yourself - last day at the market, forced by lack of belly space to pick and choose. 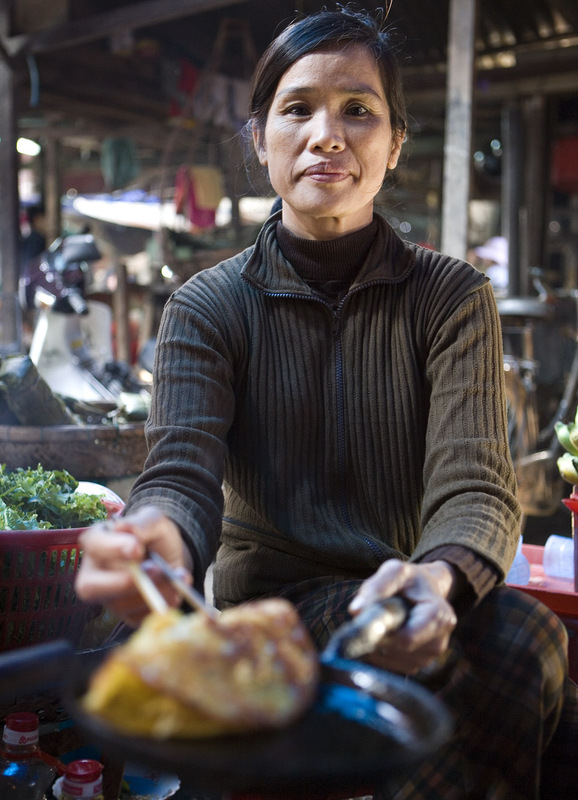 This banh khoai vendor works at a low makeshift stall to one side of the market's 'food court', a line of concrete tiled stalls housing vendors selling everything from pho to fruit shakes. 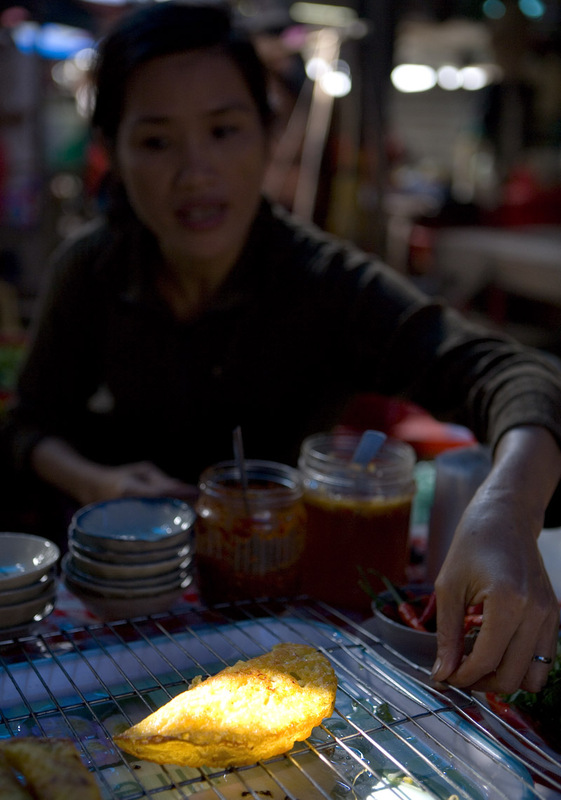 As we walked the food court line on our first morning several banh khoai vendors called out and waved their crepe pans at us - a flashing red light, in my book. We turned a corner and there this was this woman, quietly serving customers, completely oblivious to our existence. 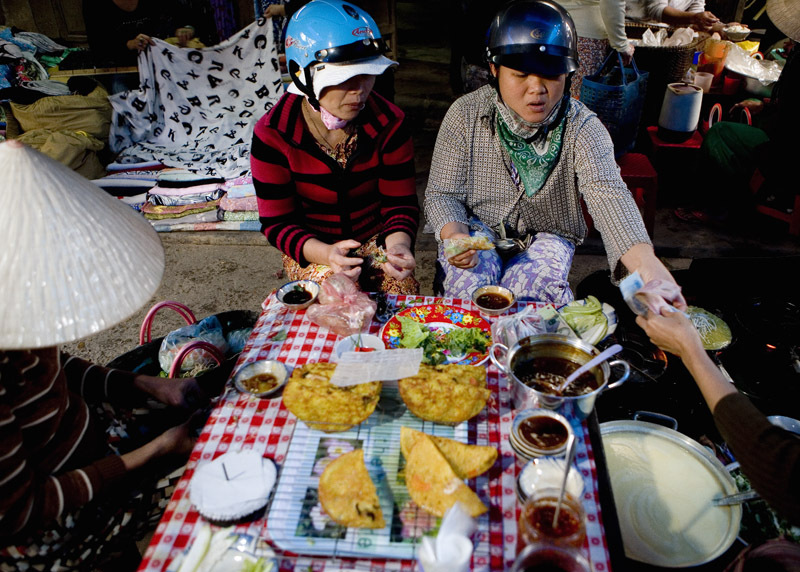 Banh khoai is the predecessor to banh xeo, a huge rice flour pancake filled with pork, shrimp, and bean sprouts that's more common in Saigon and south. 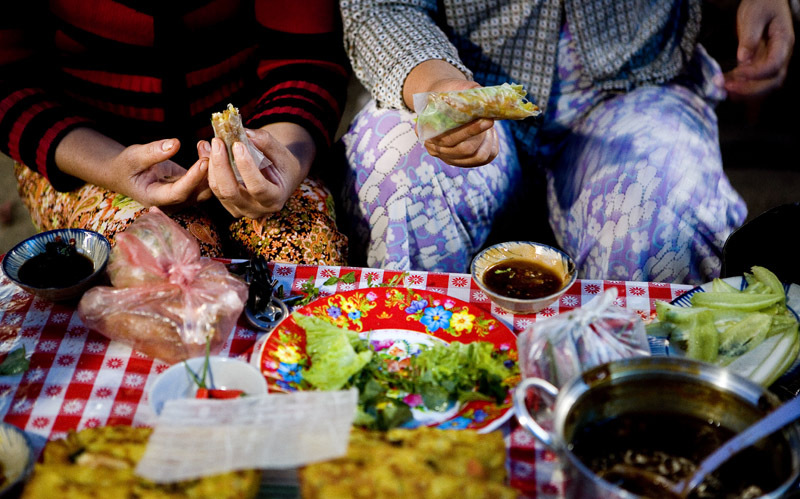 As it cools banh xeo gets unappealingly soft and heavy with oil; for me it's always been a three-bite wonder. Not so the smaller, more manageable banh khoai. 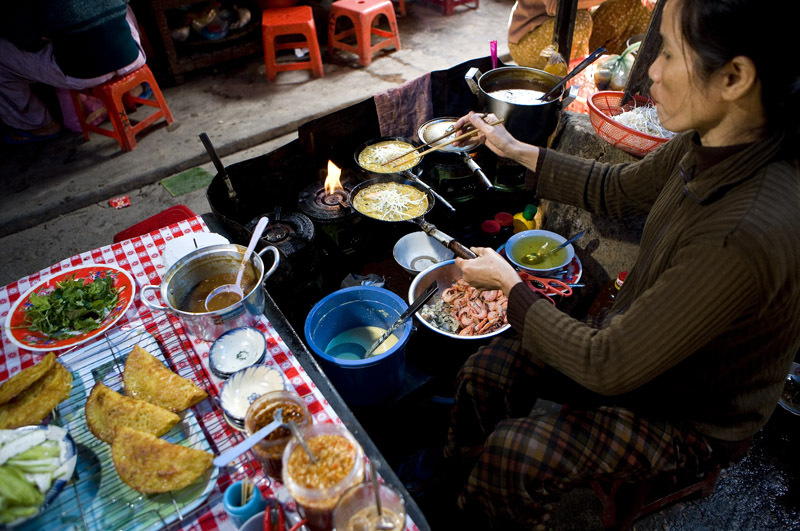 The filling in this vendor's version is minimal - a single small slice of fatty belly pork and a half a small shrimp layed in the pan after the batter's been poured, a flourish of bean sprouts added just before she slides the pancake out of its pan. 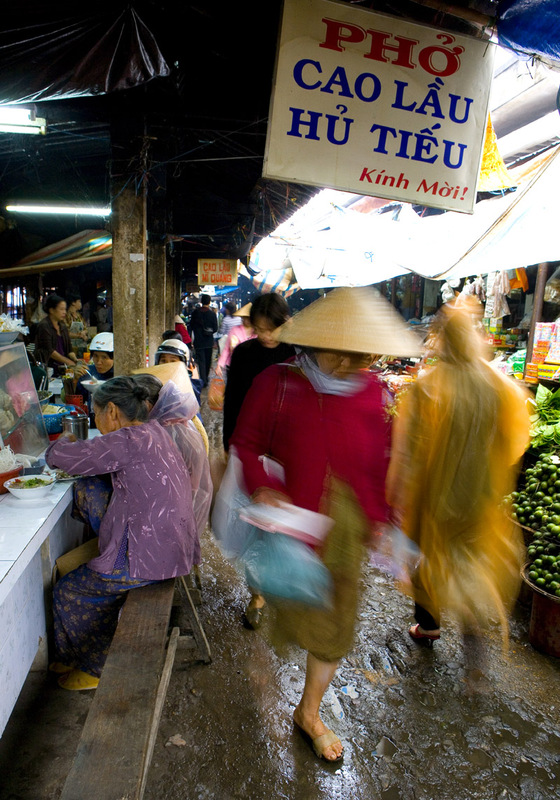 To eat, they're opened onto a square of stiff rice paper, layered with a few slices of tart star fruit and young banana and a handful of greens and herbs (sprouts, basil, paddy herb, mint, and lettuce, at this stall), and rolled tight. The dipping sauce alongside is made from soy beans and glutinous rice; chili's optional. In one, two, three ... maybe four bites you're finished. 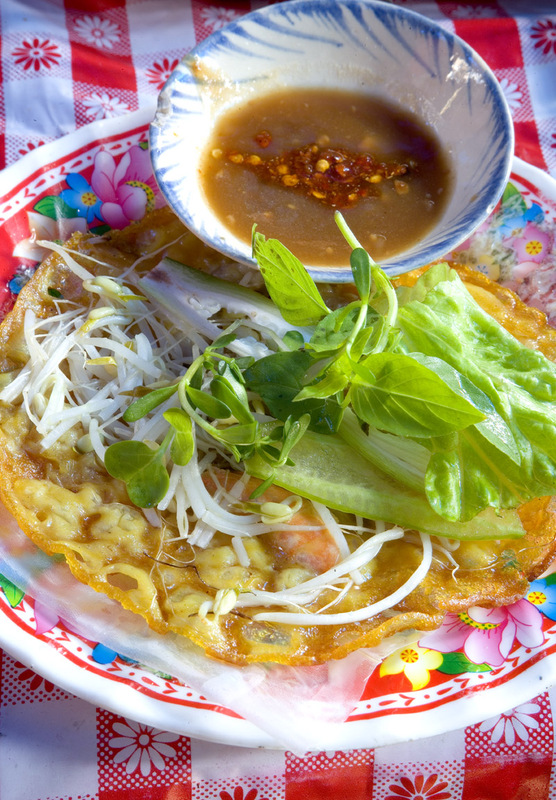 The pancake's stayed warm and its edges crackly to the end, lightly cooked bean sprouts as crispy as the fresh greens you just added. This is a heavily oiled treat, but not overly so - the extra grease works here, soaking into the stiff rice paper and mixing with the dipping sauce. 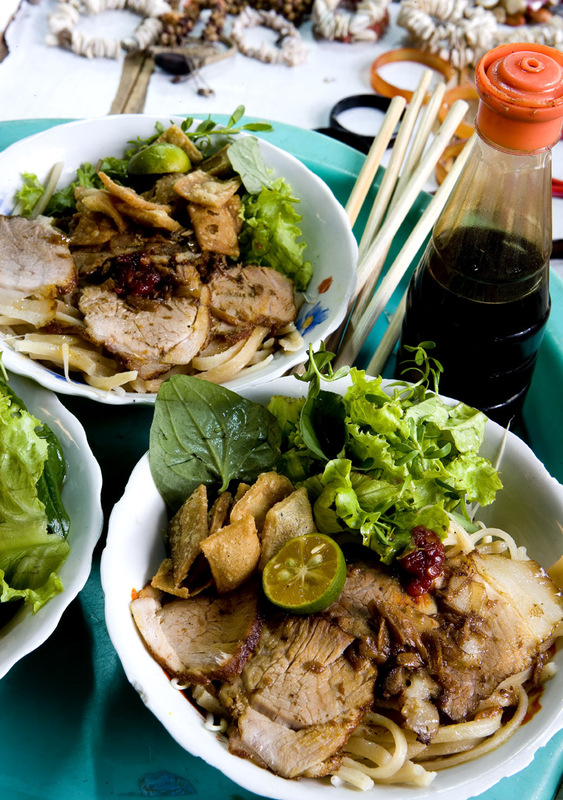 We're currently in Saigon, having just come from Hoi An, where we spent five days on the hunt for the town's best cao lau and ate our way up one side and down the other of its lovely little market (outside of the market food in the Old Town's generally been a disappointment). 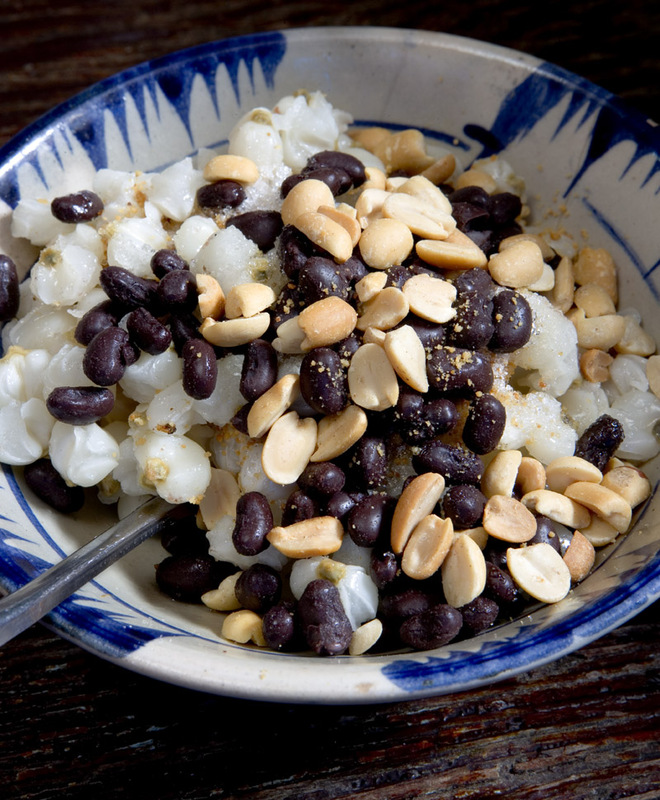 Yesterday's breakfast - one of them, anyway - was an unexpected joy: ngo bap, plump kernels of rehydrated dried corn, black beans, and roast peanuts tossed with white sugar, peanut powder, and fried shallots in their oil. It may sound a strange combination, but the disparate flavors and textures really work. More - much more - to come next week. When Dave and I were in Cianjur a few weeks ago we stayed on a Dutch-era tea plantation. We were there to do a story on The Learning Farm, a wonderful organization that recruits kids at risk (under- or unemployed youth, dropouts, etc.) from around Java and teaches them to be organic farmers. The Learning Farm recently moved from its previous location in the hill town of Puncuk to the Maleber Tea Plantation, where it leases a lovely old house that serves as dorm-office-canteen, and a plot for the farm. 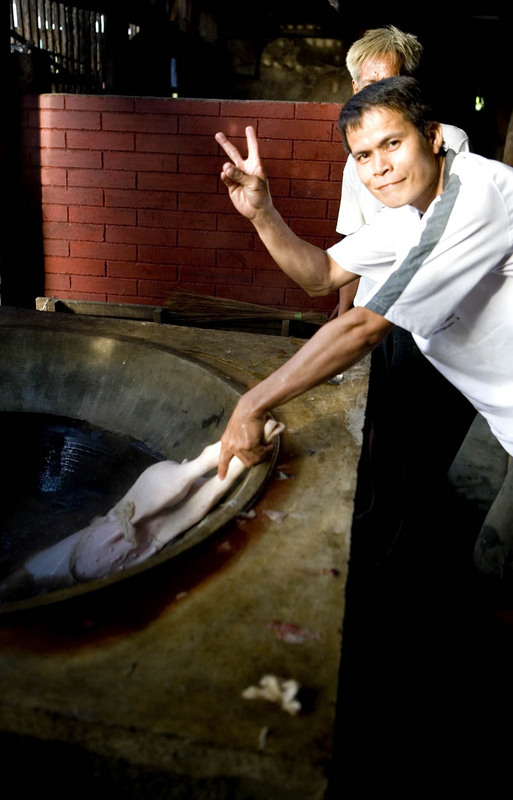 One afternoon, when we weren't hanging with the kids, Manager Hendri Adrianto was kind enough to show us around the old tea processing factory. It was quiet, unfortunately - they're not harvesting enough tea at the moment to be processing 7 days a week - but the tour was interesting nonetheless. The building is simply beautiful. 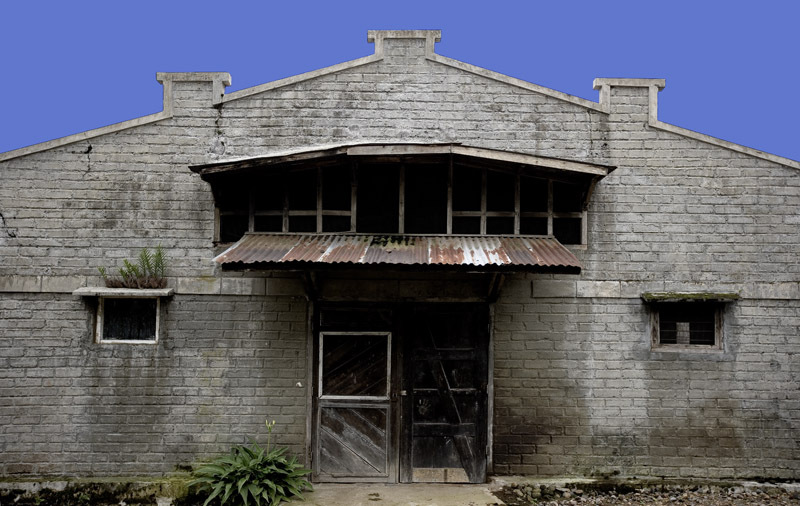 It dates to 1884 and retains many of its original materials - teakwood walls and staircase and stone tile floors. I love being in buildings with a history almost as much as I love eating and I have to admit that when I walked through those double doors and got a load of its beautiful bones, the crasser side of me couldn't help but think that this old two-story building would make just about the most amazing live-work space ever. But after more than 120 years it's still being used to process tea. And that's even better. After the leaves are harvested they're brought upstairs to the drying rooms, which are long narrow spaces lined on both sides with stacks of sliding racks. The racks are made of bamboo, and woven bamboo covers the ceilings and walls of these spaces as well, so walking into one is kind of like sticking your head into a big bamboo basket filled with dried tea (only not as claustrophobic) - you're just enveloped in a cocoon of marvelously earthy and somehow stimulating aromas. If Malaber could bottle that fragrance, or incorporate it into a soap, they'd make a mint. 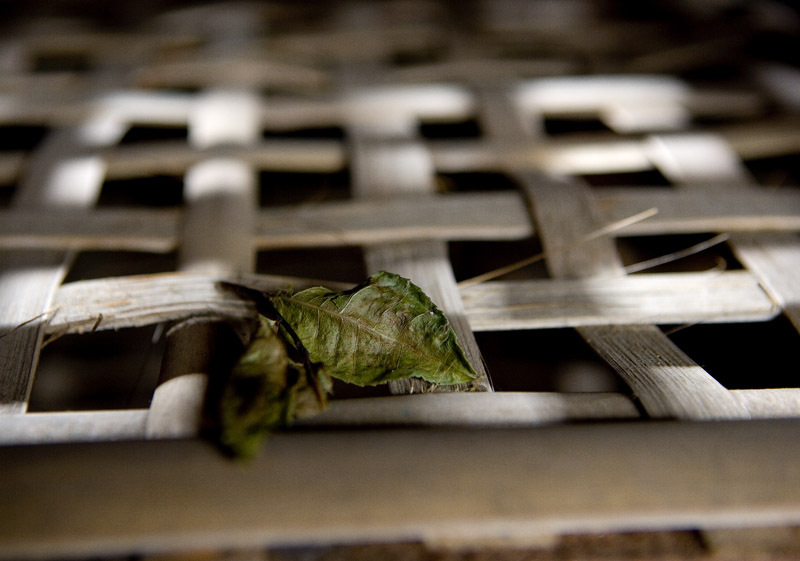 The leaves are laid about 5 cm thick on the racks and left for one and a half days to dry in the heat that rises from the sorting machines on the floor below the drying rooms and the sun that bakes the building's roof. The ground tea leaves are put into square, shallow tile-lined tubs in a room where the temperature is kept at about 18 degress celsius. 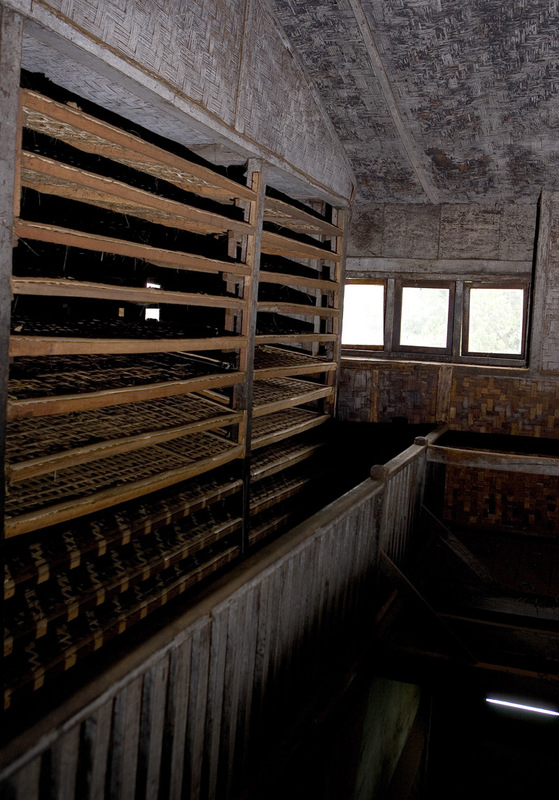 This fermentation room has an ingenious cooling mechanism: the walls are lined with coconut husks held in place behind mesh panels, and water is continuously allowed to drip over them. Fans move the coolness from the walls into the room and keep the air from getting too heavy with humidity (which might rot the tea leaves). 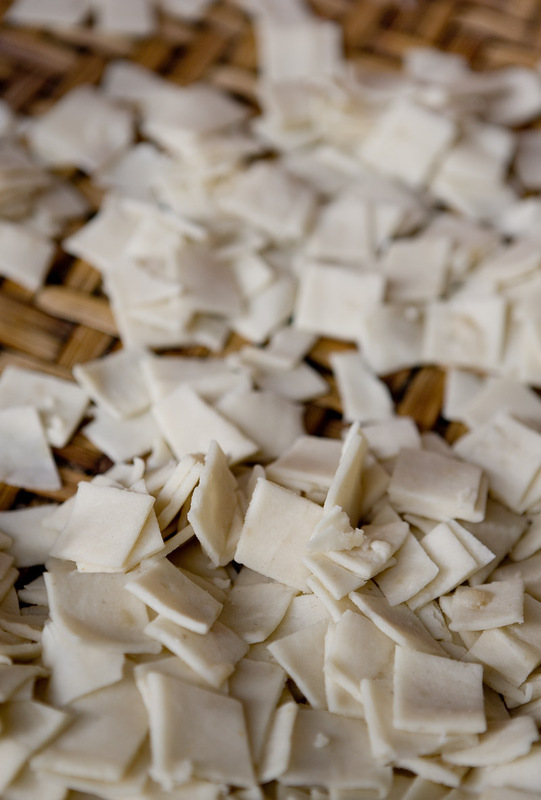 Why coconut husks? Because they're cheap and they don't rot when they get wet. Fermentation, Hendri told us, is the stage at which a black tea's flavor develops (green teas aren't fermented), and it's a crucial one - leave the leave too long and they'll rot, not long enough and they'll taste of nothing. 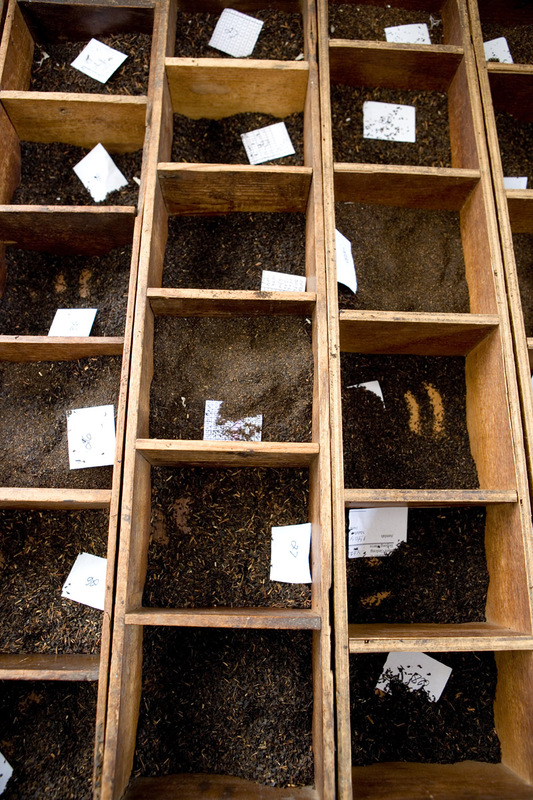 From the fermentation room, the tea leaves are transferred to furnaces, called 'sirocco', for drying. 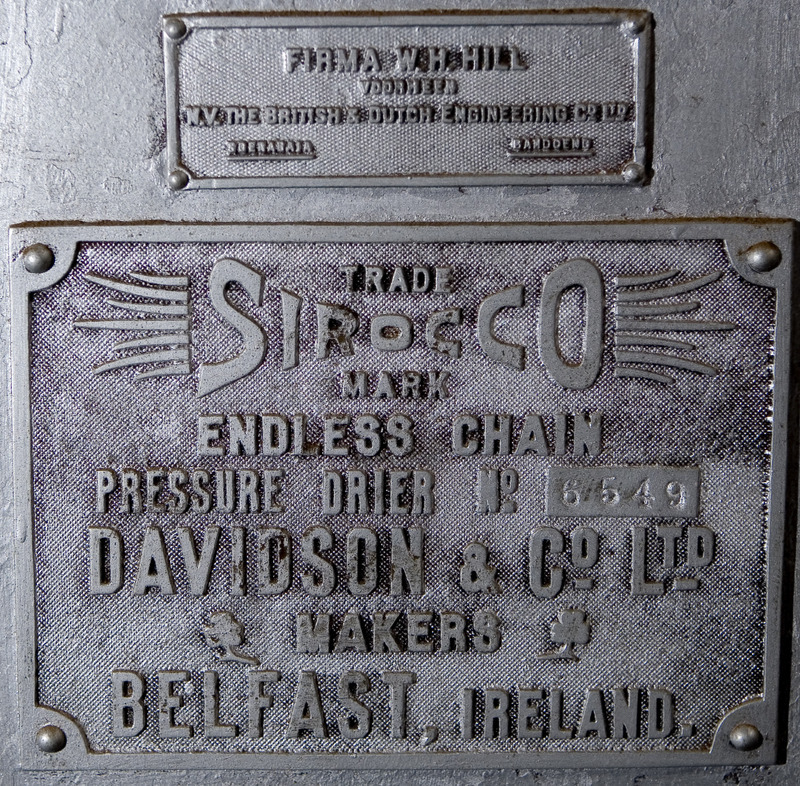 One of the sirocco is original to the building, if you can imagine that. The sirocco reach a maximum of 150 degrees celsius, and the leaves are dried for about 20 minutes or so, depending on how hot the furnace is. After drying the leaves are moved to another room where they are sorted by weight. 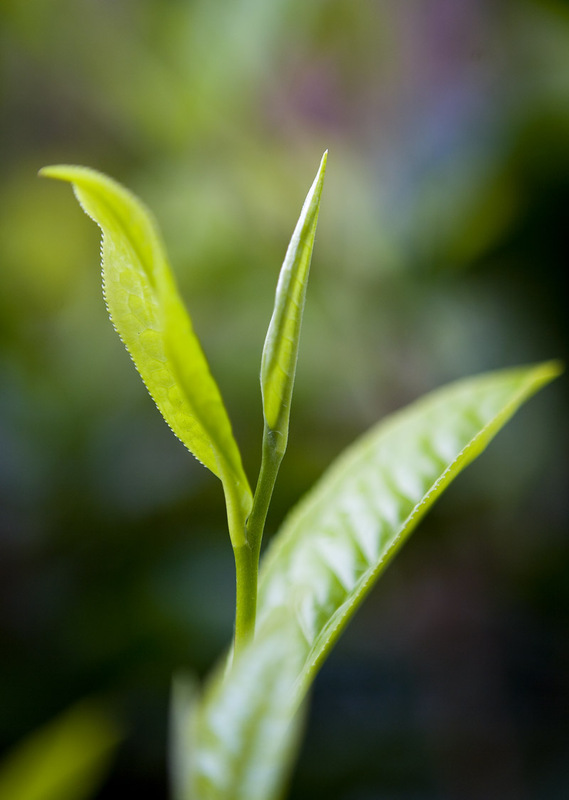 Heavier leaves are considered the higher grade of tea. The highest grade are black orange pekoe. The lowest grade looks like sawdust, and presumably tastes like it too. 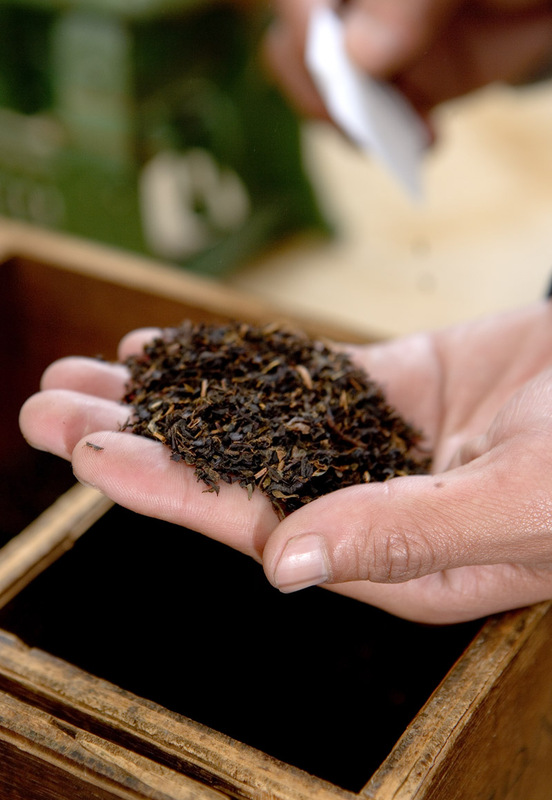 The teeniest leaf scraps - a mixture of high and low grades - go into tea bags, while high-grade leaves are packed, by hand, into these nifty boxes. 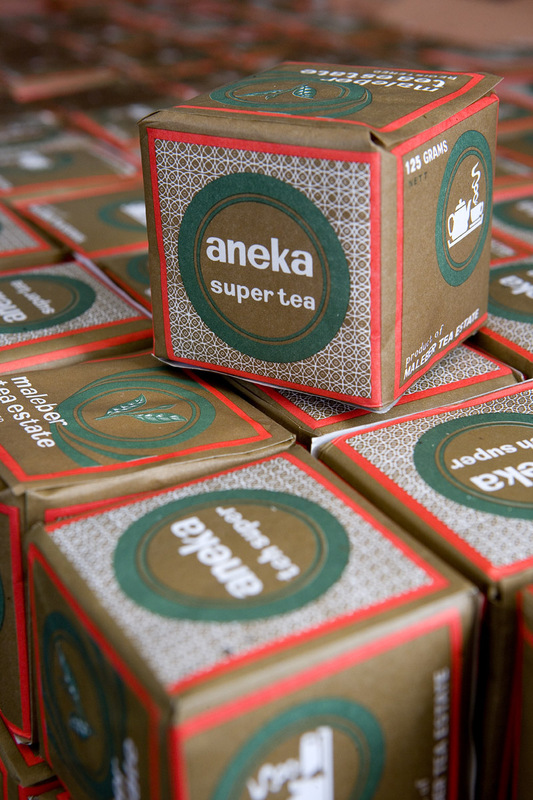 I'm not much of a tea connoisseur; when I do drink it I tend to veer to green. But while staying on the plantation we woke up with Malaber's black orange pekoe and I have to say it was a bit of an eye-opener (pun intended). (It was also very fresh.) We made sure to pack a box home, and I'm starting to alternate the Malaber pekoe with my usual green for my afternoon cuppa. Good stuff.